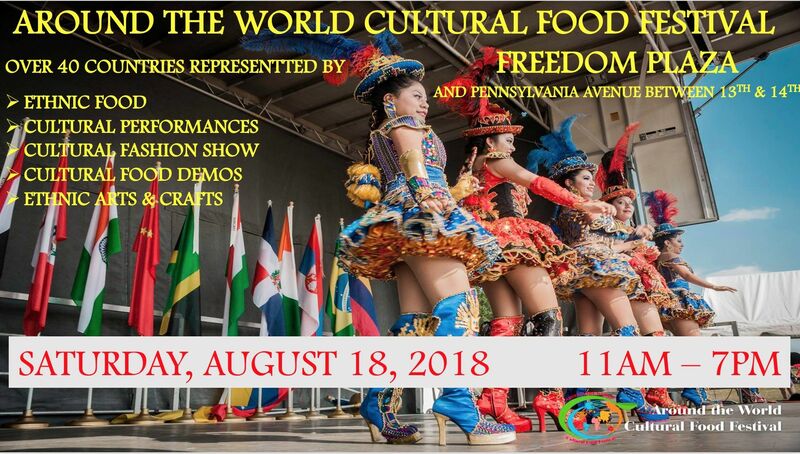 Celebrating the rich intercultural diversity, the Around the World Cultural Food Festival opens its doors for the annual event Saturday, June 16, 2018 from 11:00AM – 7:00PM on the National Mall in Washington D.C – corner of Constitution and 17th Street. Around The World Cultural Food Festival creates a cultural and educational experience like no other in the DMV. The festival delivers a once in a year experience in which our vendors are encouraged to present the best of the best from their countries. Our restaurants not only sell food – they showcase, educate and teach their culture through food. With only 1 restaurant per country ~ we are carefully selecting the best of the best for our attendees! There will also be an array of cultural performances, traditional costume exhibitions, a VIP lounge, an embassy tent with cultural presentations, a tent with cultural activities for kids, a cultural food demo tent with food preparation demonstrations, and much more. Entry to the festival is free and the public will have the opportunity to learn, to eat, to dance, to shop, to witness these vibrantly connected cultures and create their own connections with each and every single country presented in the event. For more, go to www.aroundtheworldfestival.com and find us on Facebook.